Once upon a time the remix of a rock record consisted of little more than adding several bars of an instrumental breakdown after the second chorus, about an extra two minutes of beats with beefed-up Linn drums and some splash pads over the snare throughout. Money for old rope to be sure but at least tracks such as the 12" version of The Sisters Of Mercy's 'Temple Of Love' allowed your common or garden indie DJ to nip out for a quick slash while the Goths were getting down to some serious spiky chicken dancing. Of course, that was then and this is now and while the whole music business struggles to regain some kind of composure after being turned on its head and having its rules and business model kicked beyond recognition, it still comes as a surprise to find Grinderman being the subject of a remix album. However, unlike that equally unlikely collection of rock & roll reprobates The Jon Spencer Blues Explosion who offered us their Experimental Remixes album back in 1995, Grinderman have, with the obvious exception of Andrew Weatherall, eschewed the dance remixes route and handed the masters of their second album over to fellow rock musicians. The end result is an album of two halves – one satisfying, the other less so. Opener 'Super Heathen Child'- featuring the squalling six-string dexterity of Robert Fripp - will be familiar to anyone owning the 12" vinyl edition of 'Heathen Child' so it's with A Place To Bury Stranger's reading of 'Worm Tamer' that the album truly springs to life. Oliver Ackerman's pursuit of pushing sonic limits perfectly compliments Grinderman as he overhauls the original to breathtaking effect. Similarly, Nick Zinner's stripped down version of 'Bellringer Blues' evokes the perhaps unwholesome image of Grinderman high on peyote as they dance naked round a campfire taking shots of mescal. Former Bad Seed Barry Adamson follows a similar route with his stark re-imagining of 'Palaces Of Montezuma' while Queens Of The Stone Age's Josh Homme brings his customary metronomic precision to the re-named 'Mickey Bloody Mouse'. So far so good but the album then suffers from too much repetition of the source material. Are three versions of 'Evil' – one of them a demo version of the original – really necessary? Even if one of them is by drummer Jim Sclavunos and The National's Matt Berninger? A perfunctory and dubbed-up 'Heathen Child' is revisited by Andrew Weatherall and while UNKLE's 'Hyper Worm Tamer' has enough personality of its own, it remains difficult to shake the feeling that their attention would have been better directed elsewhere. 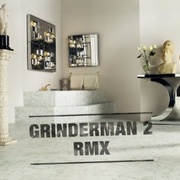 Grinderman 2 RMX provides an enjoyable enough distraction but ultimately this is a collection of material that would have worked better as an EP rather than an album. Crucially, it doesn't really offer DJs the opportunity of the mid-set pee.